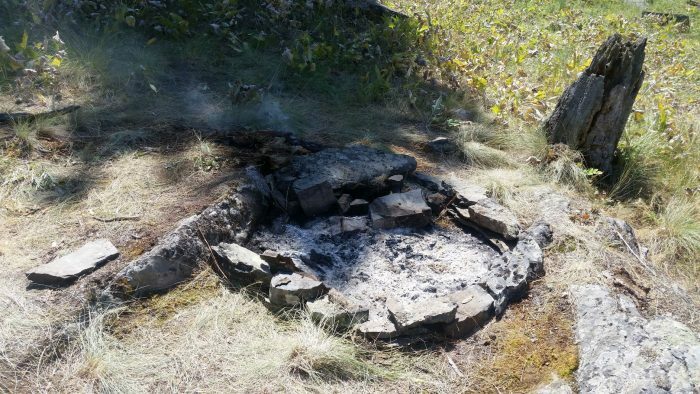 Montana Fish, Wildlife & Parks game wardens extinguished an illegal campfire on Wild Horse Island State Park, averting a potentially serious incident amid heightened fire conditions. On the morning of July 19, FWP game wardens Chris Neu and Morgan Post responded to a report of illegal campers on the west side of the island on Flathead Lake. Neu and Post discovered a smoldering fire that was creeping outside of a makeshift rock fire ring. No one was present at the scene. When Neu and Post began breaking apart the fire ring, the smoldering logs immediately flared up, illustrating the serious nature of the threat. The fire was found in same area as the illegal campfire that sparked a 5-acre blaze in July 2015. Camping, smoking and fires are strictly prohibited on Wild Horse Island State Park. Grass, brush and other light forest fuels tend to dry out by early summer on the island, creating combustive fire conditions. Fire conditions continue to worsen across the region and this week the Montana Department of Natural Resources and Conservation announced that fire danger is now “high” in the Flathead Valley. Wild Horse Island spans 2,160 acres off the west shore of Flathead Lake. The state park is managed as a primitive area, and visitors are asked to protect and respect the park to preserve its natural character. The illegal campfire remains under investigation. Anyone with potential information about the incident is encouraged to call 1-800-TIP-MONT. Callers can remain anonymous.